So let’s step into this lil house for the first time, may I mention that the solid brass door knob is original from the 1930s. Next up is the Dining Room… THAT beautiful archway…Can’t quite get those in newer homes without paying a fortune and I have to mention all the natural light pouring in from those huge windows. And yes, there is wallpaper even on the CEILING. Ahhhhh!!!! But then I looked down and saw those tall baseboards. Yep, everything is going to be alright. Off of the dining room through that heavy swinging door is the Kitchen. 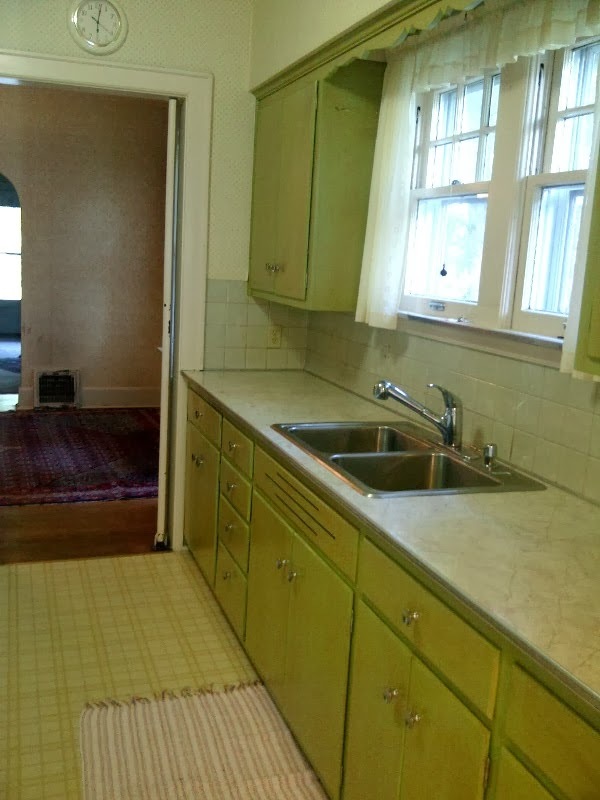 First thing that caught my eye was the little breakfast nook… well okay, okay, first it was the green cabinets and outdated linoleum flooring, and again WALLPAPER. And look another beautiful archway that brings so much character to the house leading to the back door and Basement. 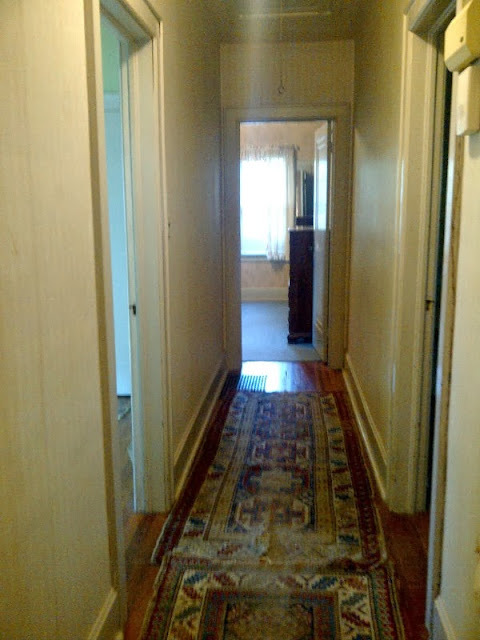 Going back through the dining room is a door leading to a very long Hallway with 6 doors!! !...plus a full sized pull-down attic door, and a door for an old house fan. And of course MORE WALLPAPER! There are three bedrooms in this house, so let’s start with the Master. 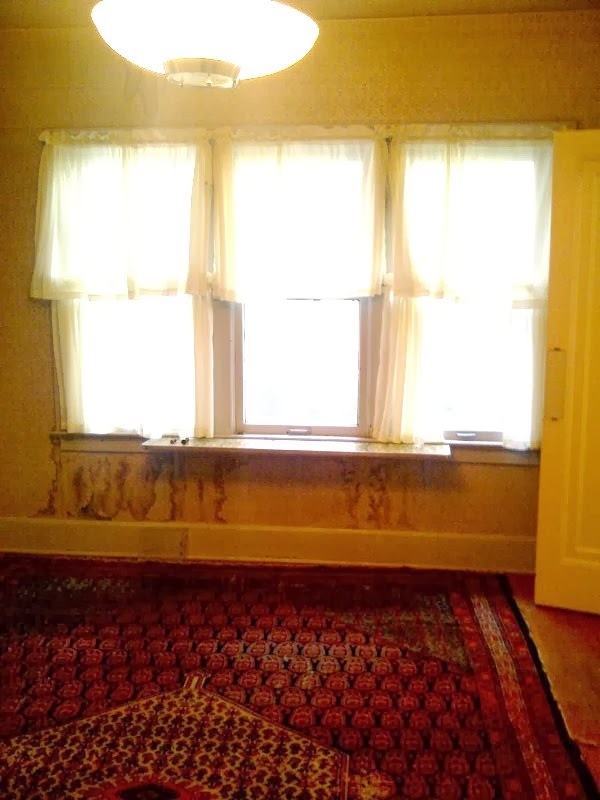 The floral wallpaper with turquoise trim has got to go along with the curtains covering three big windows! 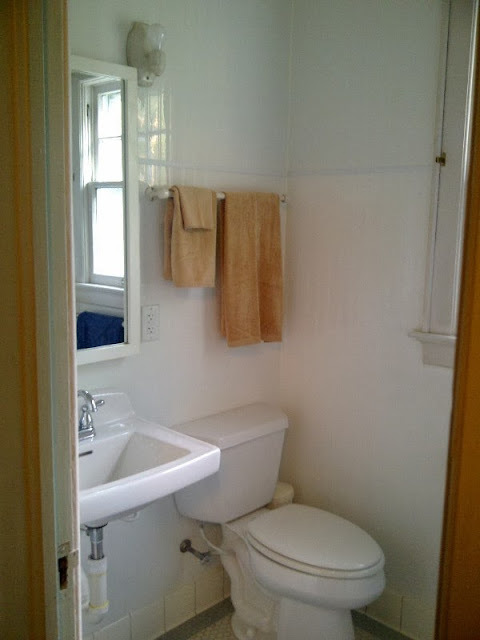 It has a large closet with huge sliding doors (8 ft. tall), and an attached Master Bath with original blue and white honeycomb tile. Oh my! What’s this?? A walk-in tub? It’s beautiful, but I’m not ready for one yet. It’s got to go! Top of the line Premier Care walk-in whirlpool tub/shower that I just found out was purchased last year and never used. I am selling this at a reasonable price; If anyone is interested, please contact me. The Second Bedroom is the only room in the house that doesn’t have wall paper. The plaster walls are in good shape in here, only a large crack from settlement. 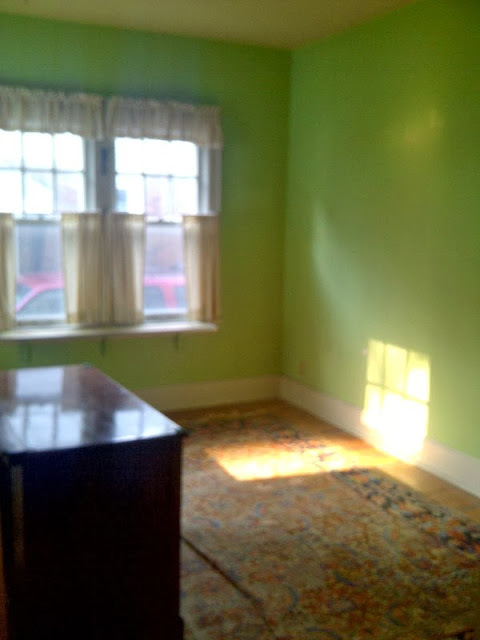 I really like this room, except the green is a little too "hot" for my taste. Feels very homey with all the natural light coming in through the large windows. 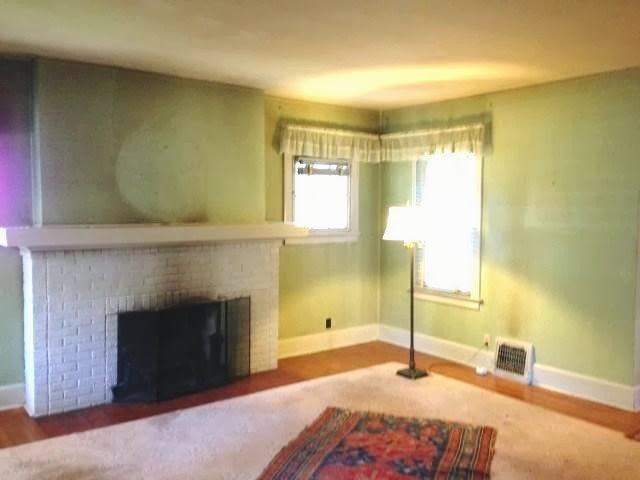 Hmmm… I’m starting to notice a trend here…another room where the windows have plant shelves and plant hangers… the previous owner must have loved plants. Moving on to the Guest Bathroom. It’s straight out of the 1930’s with the wall paper, plastic stick-on pink tile, original cast iron pedestal sink, medicine cabinet, porcelain light fixtures, and original bath tub fixtures! 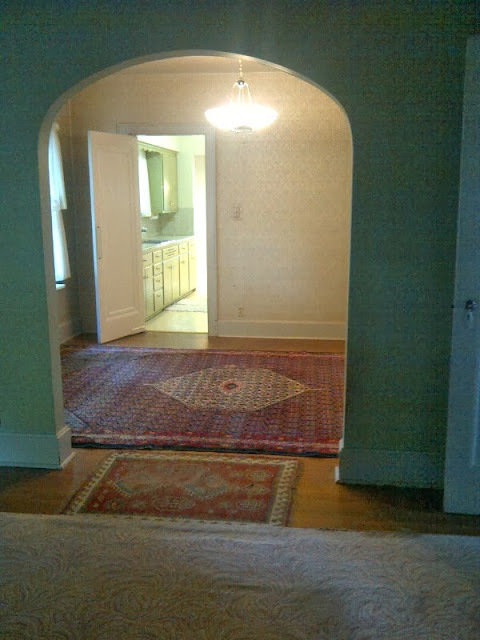 Look at that beautiful archway though and the white honeycomb tiled floor is in great shape and in-style. 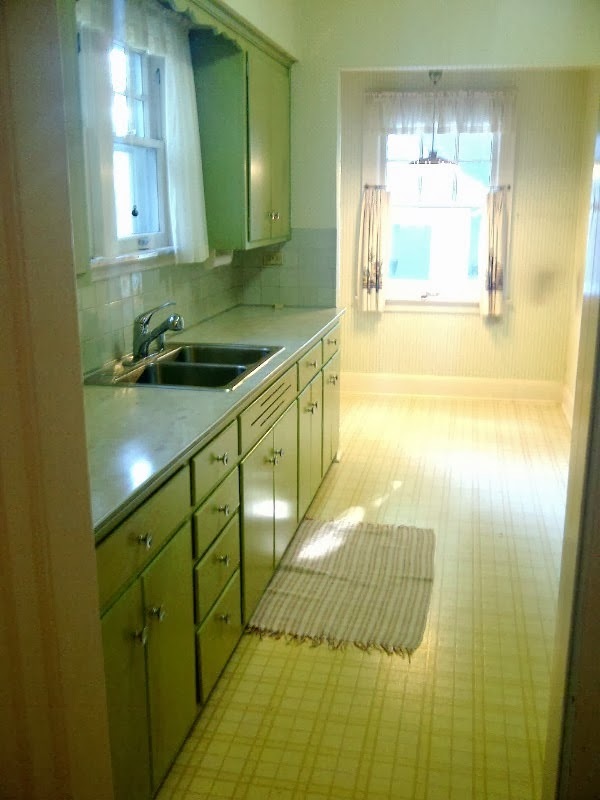 So much storage space with the cabinet and drawers, and it is even has a laundry chute that goes down into the basement. And last but not least is the Third Bedroom. Good sized room with a large closet, just have to get rid of that outdated wallpaper! 1 comment on "HOUSE TOUR"
Such an antique door knob. I'm surprised it still works, someone did a good job at maintaining it. But anyhow, good post here. I liked it!